We are continuing with our series on LEGO Designs and this time we set out to make a LEGO Robot. We are keen on robots and thought this would be the perfect project. If you have a robot lovin’ kid, get out the bricks and have a go. You can use whatever LEGO pieces you happen to have on hand. I do admit that throwing a few specialty pieces onto the robot really makes it look neat. Dig around in a few sets to see what pieces look “robot-y.” We found those pieces first and built our robot around them. One thing we found out right away is that making LEGO Robots is a very creative project to work on. Get out all your LEGO bricks and elements and sort through looking for robot looking bits. It is a little hard to explain how to make each of these robots as we just grabbed fun looking pieces and worked on trying a bunch of different things until we got the results we wanted. 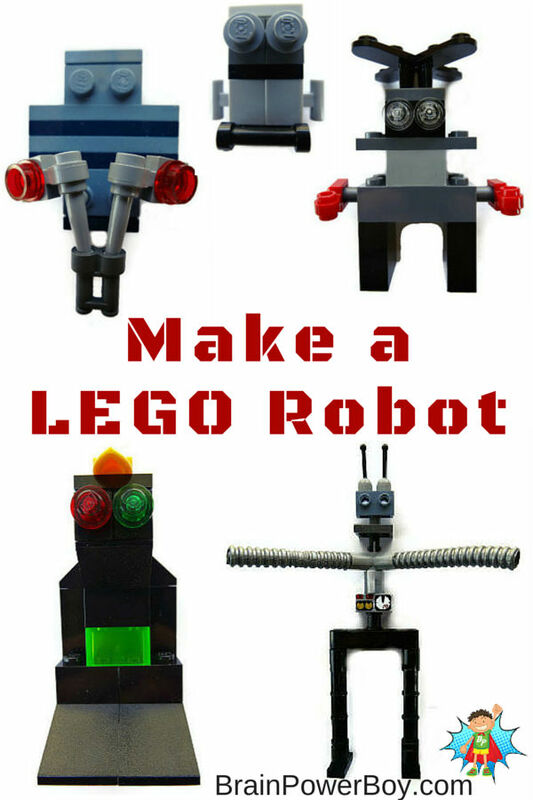 Use the images for inspiration and create your own LEGO robots for a fun project. Many of the pieces we used came from the classic series but we also used elements such as the bendable arms and some LEGO Technic pieces that we had. The robot with the spinner on the top is a fairly easy one to make. Take two longer 1x2s for the legs (if you don’t have those just use 2-3 1×2 black bricks and stack them to make two leg pieces. The grey 2×4 brick has ends sticking out from it to which we attached a flat red piece with a circular piece attached. We then used a light grey 2×2 with a 2×4 flat on top. A slanted back piece was used behind the clear stud eyes. A flat with a knob sticking up was used to attach the rotation at the top and it actually spins! Making your own LEGO designs is a great learning experience for boys and I hope you will encourage them to try a few different ideas. For more LEGO goodness go here! LEGO Books can really help to take your building to another level and we have reviewed a lot of them. Try our Homeschool Unit Study Robots for great robot learning ideas including how to make your own robot and other fun robot activities for kids of all ages. And if you have a young robot fan you have to see this Robot Memory Game! Thanks for stopping by! If you liked this, would you please share by using the buttons below. It helps me know what people would like us to write about. Oooh these are way cool! my kids will love them! Thank you! Thanks much Kate! I appreciate you stopping by and commenting. So glad to hear your kids will have fun with this idea. Yay for videos! These robots are super cute – I love the idea of looking for robot-y pieces to inspire the robot creation! We just did a huge reorganization with all our Lego bricks! I know my son will love these. He has been telling anyone that will listen that he is a master builder. Thanks! 🙂 that is so cute Marie, a master builder. Glad to hear he will enjoy them. Nice robots! Featured you on Mom’s Library this week!